I was so excited when this beautiful dress came in the mail last Friday. I had a bridal shower to go to on Saturday with a 'High Tea' theme and I just knew this would be perfect. As a person who loves floral, but is VERY picky about the floral prints, this was love at first site. 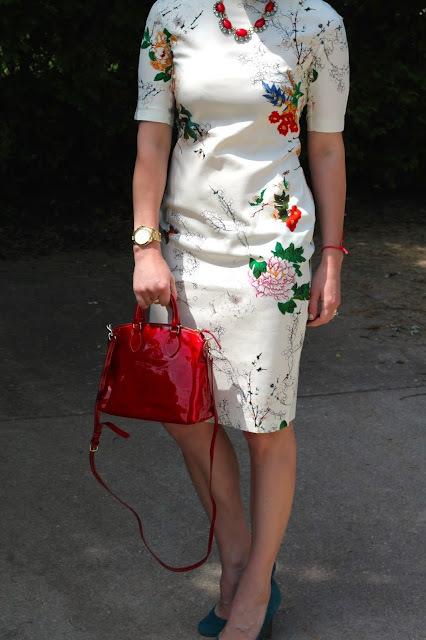 The bright floral colors on the dress against a white background make it flattering for all skin tones and easy to pair colored accessories with like I did. I get cold very easily so it is nice to find a dress that isn't sleeveless, too. Right now it's on sale for only $20!! I would recommend sizing up when you order. I have a medium on for reference and it fits perfectly. Heels worn here, here, and here. Katya from Style Sprinter is co-hosting today. She always looks so incredibly chic and on trend. 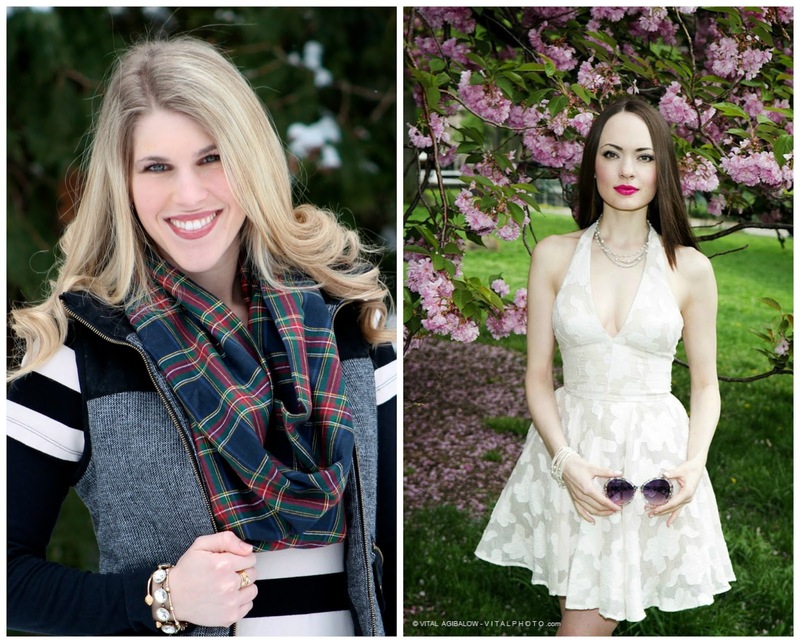 Katya has a fun Friday Five feature and also has great tips on fashion, beauty, and sales! Make sure you head on over and say hello! I love the floral print and cut of that dress! It fits you like a glove! Those teal heels are the perfect touch! WOW LAURA, THAT FLORAL SHEATH IS STUNNING. I think it would be great for a wedding as well not just a bridal shower. You chose the perfect necklace and wedges for it, for a shower. And Katya is stunning as is her style. Gorgeous! No other word needed for this look...well, maybe lovely too! Such a pretty dress, lady! I love you wore your hair up with it to show off that pretty neckline! The white + dainty florals on this dress is amazing! It is so feminine, yet super fun at the same time. The accessory options are endless! You look stunning in this dress! I love the simple silhouette and the fun and vibrant floral prints! love the dress! so beautiful! so summery! That is a great dress and looks fabulous on you! You look so pretty! I love that fun dress and the topknot is perfect with it! Gorgeous dress! It looks beautiful on you. looking stunning in this!! love it. LOOOVE!!! The shape of this dress is perfect on you! Cute shoe and bag additions too. GORG! Oh that dress! I've been obsessing over it on Instagram for days now...love it! It fits like it was made for you and it is so perfect for a bridal shower. Dear Laura, thanks a lot for the opportunity to co-host this linkup with you! The funny thing is that I own the exact same dress you are wearing in these photos! What a cute incidence! It just proves that we share a similar taste in clothing. I am so-happy to find my style soulmate! Have a blessed day! I have seen this dress and almost ordered it because I thought it was so pretty. It looks great on you, and how perfect for a tea themed shower! I love it when things arrive just in time. Your teal heels and red bag are the perfect compliments. You are stunning in florals!!! Wow! Drop dead gorgeous, Laura! This dress is beautiful! I love the classic sheath shape, and the subtle floral is so nice. Great teal heels too! You look gorgeous Claire. Thanks for the headsup with sizing up, I am sure you looked amazing at the shower. You look absolutely lovely, Claire. 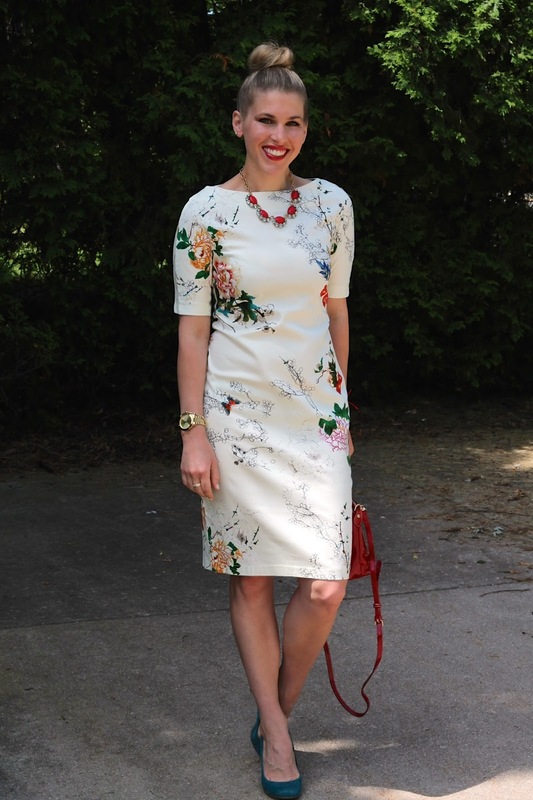 Like you said, a perfect dress for a bridal shower! You look so amazing. I love your hair, the dress, the shoes, everything is perfection. You look so elegant and beautiful. 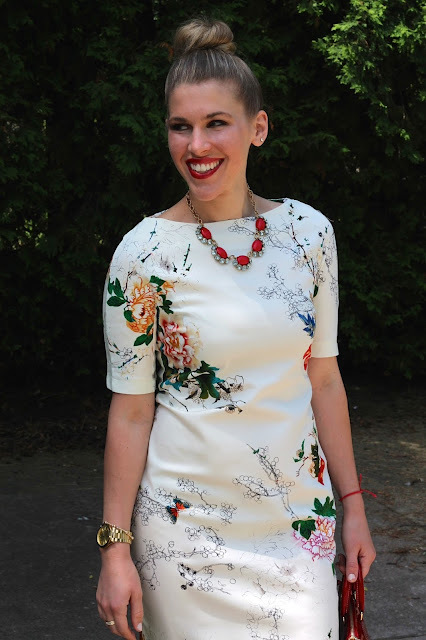 You could not have worn a better dress for the 'High Tea' themed bridal shower. 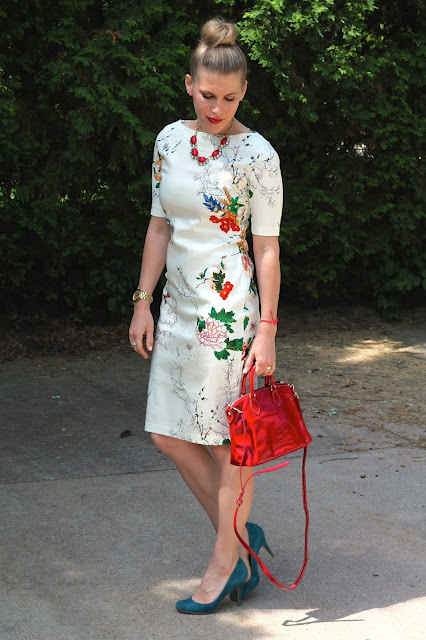 The print is beautiful and the red necklace and bag just so stand out against the white. But I love most how you've gone for a different colour in the shoes. That lovely dark teal - yes, yes yes! And great to see a summer dress with a little sleeve too. This dress is perfect, so feminine and chic! I've been thinking about picking that dress up for ages - it looks stunning on you! Thanks for including info on sizing, that's always what I've been nervous about when ordering from Sheinside! yes to all that. you look fabulous, your hair, the necklace, the shoes. love it. I love that dress--the floral print is so pretty! I love the way the colors are bold without being too overwhelming. And the sleeves! Love the sleeves. Stunning pic! The dress looks great on you! holy smokes, this looks AMAZING on you!! This SheIn dress looks great on you! That is indeed the perfect dress for a bridal shower--and many other event, too. And...you look gorgeous in it! Thanks for hosting another lovely link up, Laura. T.
This abstract floral is such a refreshing alternative to the traditional all over floral prints. Such a classy cut as well! Pretty dress! Pretty heels! Pretty Laura! I saw this dress at Shein! I wanted to buy it so bad, and now you're making me regret why I haven't bought it yet. So gorgeous and retro! What an elegant, classic yet fun and flirty dress! I can't believe it's only $20! That's a steal for sure! This dress is so perfect on you! 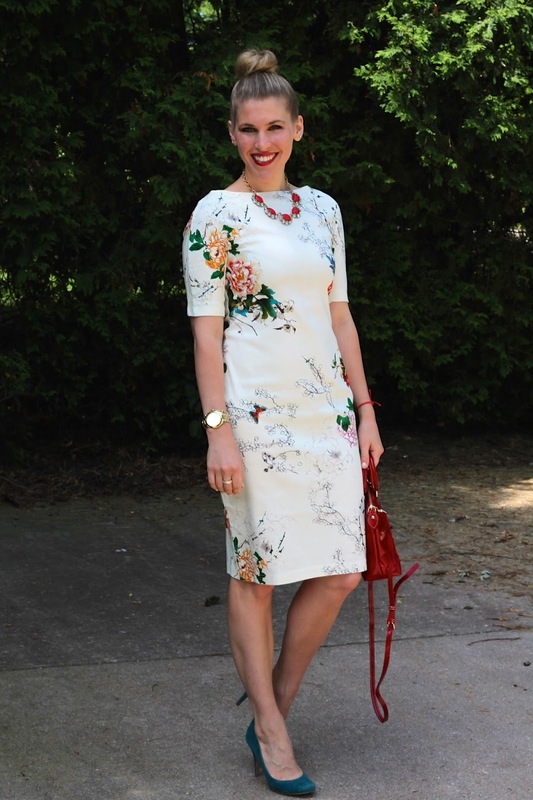 I love Shein for florals because I feel the same way as you do. I think this might be one of my favorite looks from you and on you. SO pretty! I am so in love with this dress of yours! OMG it is elegant! Thank you so much for hosting for us! What a pretty dress! I'm quite picky about florals too, but I love this print!